Designed to remove vandal marks from different types of surfaces. A special blend of solvents removes crayon, ink, spray paint and lipstick. Spray directly on marked or stained surfaces, let stand 30 seconds, then wipe with clean cloth. For difficult marks, spray again, let stand for 60 seconds. In extreme cases use a stiff brush and work into stained area. Wipe off again. Repeat process until area is cleaned. Some synthetic surfaces such as asphalt tile, rubber, certain paints and plastics may be damaged by solvents. If in doubt as to type of surface, try first on small hidden area. If no solvent damage occurs on test area, go ahead with cleaning process. Loosens most marks in a matter of minutes. Merely spray, wait, and wipe. 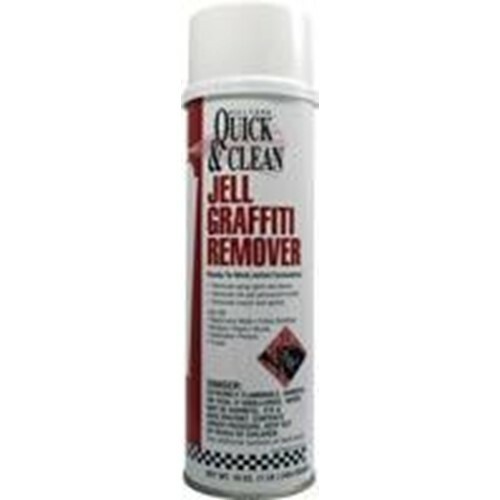 Use Graffiti Remover safely on walls, public bulidings, bridges, signs, buses, and many other surfaces.